Cassie and Emilie do the celebratory gallop all along the fence, with everyone else joining in on the fun. I have wanted to move Emilie to a barn with more pasture for a while and now things have finally come into place. 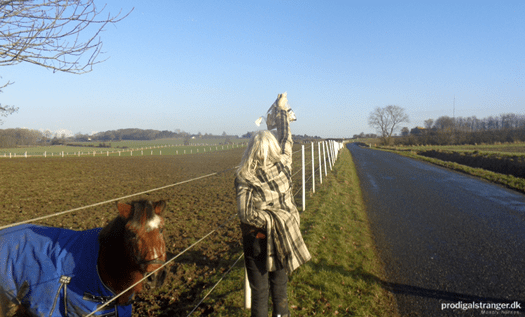 Her and her mate, Cassie, have moved to Vestfyns Rideklub on Funen where she will be sharing roughly 14 hectares, or 34 acres, of pasture with fifteen other horses and ponies. 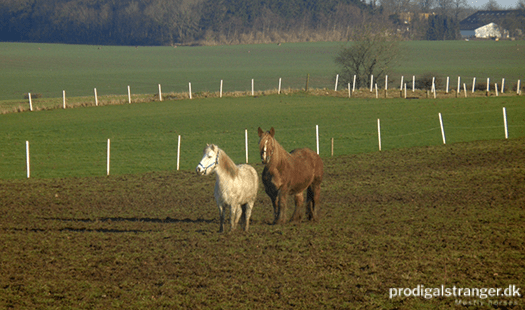 Emilie and Cassie are both horses that require a lot of all-round exercise. 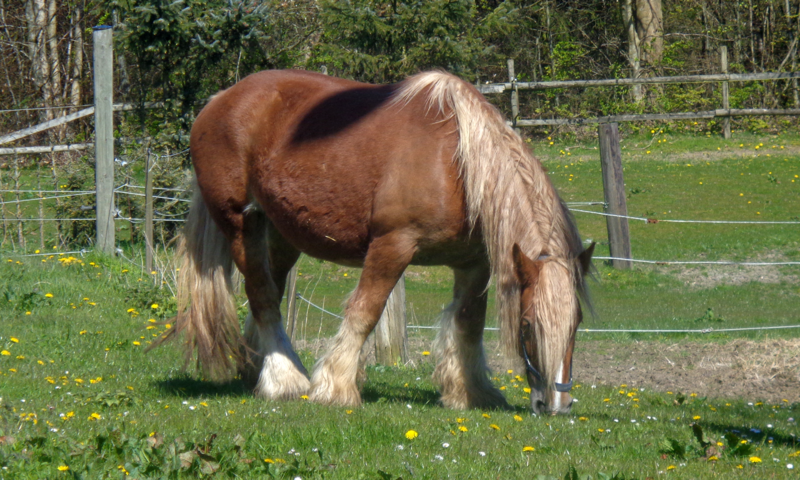 Welsh Mountain ponies are inclined towards getting tubby, and Jutland Drafts tend to develop arthritis and leg problems if they stand still a lot. They don’t need to follow a sadistic fitness routine, but walking around at their own pace on enough land all day will have a large impact on their health regimen. Cassie has been struggling with her weight and Emilie needs to build up muscle mass after her vacation year after surgery. There’s enough grass that it’s worth plodding around to find, but not enough to influence their weight and diet much. 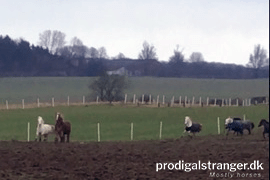 Mud has been a severe challenge in Denmark this winter. Even barns that usually don’t particularly struggle with wetness, have been literally swamped. I went to look at several farmsteads and barns closer to where we live than Vestfyns, and the one challenge they all faced? Mud. Horses standing in knee deep slush everywhere. 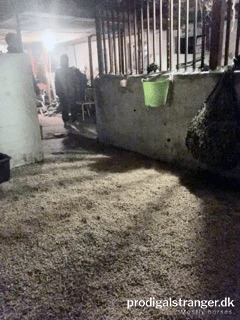 Most farms are desperately trying to save their pastures from the extreme amount of moisture this winter, which means that the horses also get cooped up in smaller areas in order to not churn the fields into mud beyond repair. 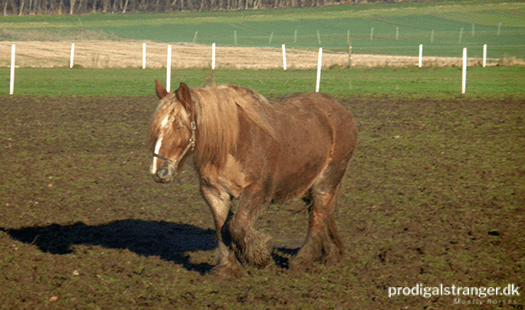 Draft horses such as Emilie, with their heavily feathered legs, are particularly prone to fungal infections due to dampness. We have managed to fend it off so far this winter with a healthy dosage of zink in her food, but finding a 14 ha pasture that’s decently dry (except the muddy area by the barn door) is fantastic. Having both indoors and outdoors arena, as well as good options for hacking out in the area, well, that turns it into a godsend. 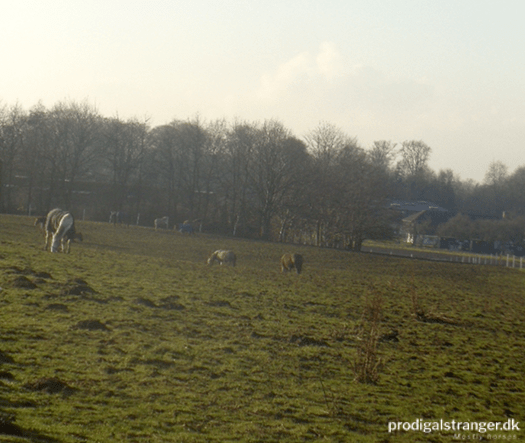 Day Two Challenge: Luring ponies with carrots. It worked — more so on the barn’s oldest pony, Sally (29). They heard us, and they are approaching, one mouthful of grass at a time. The pony is white. In theory. 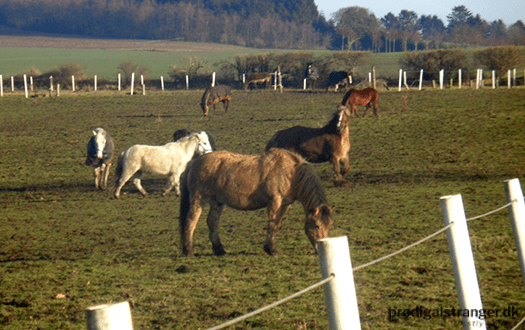 The pasture isn’t bone dry — nowhere is, with the warm, wet winter we’ve had. But the mud is not knee deep, there’s still a bit of green, and of course Emilie managed to find somewhere to roll around until she’s properly camouflaged. Both horses seem to integrate well into the new herd. Cassie leads, Emilie gets between her and anyone that looks vaguely grumpy. As a bonus twist of fate: Vestfyns Rideklub is where we used to board my Arabian, Kvik, and my mother’s Knapstrupper/Thoroughbred cross, Silverfox, back in the early 1990s. My longest lived cat (18 years!) was born there. It’s a bit like coming home. Previous PostPrevious Take a break!